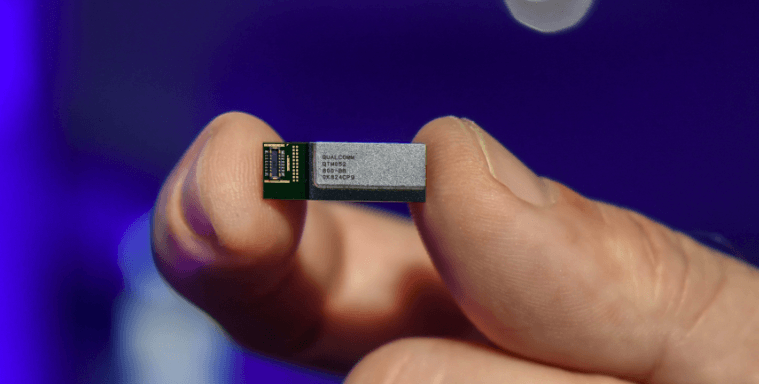 Qualcomm today unveiled fully-integrated 5G NR millimetre wave (mmWave) and sub-6 GHz RF modules for smartphones and other mobile devices. The Qualcomm QTM052 mmWave antenna module family and the Qualcomm QPM56xx sub-6 GHz RF module family pair with the Qualcomm Snapdragon X50 5G modem is promised to deliver modem-to-antenna capabilities across several spectrum bands, in a very compact footprint that is suited for integration in mobile devices. Until now, mmWave signals have not been used for mobile wireless communications due to the many technical and design challenges they pose, which impact nearly every aspect of device engineering, including materials, form-factor, industrial design, thermals, and regulatory requirements for radiated power. As such, many in the mobile industry considered mmWave highly impractical for mobile devices and networks, and thus unlikely to materialise. The QTM052 mmWave antenna modules work in tandem with the Snapdragon X50 5G modem to help overcome the formidable challenges associated with mmWave. They support advanced beam forming, beam steering, and beam tracking technologies, drastically improving the range and reliability of mmWave signals. They feature an integrated 5G NR radio transceiver, power management IC, RF front-end components and phased antenna array. Qualcomm revealed that they support up to 800 MHz of bandwidth in the 26.5-29.5 GHz (n257), as well as the entire 27.5-28.35 GHz (n261) and 37-40 GHz (n260) mmWave bands. Most importantly, the QTM052 modules integrate all these capabilities in a very compact footprint, such that up to four of them can be integrated into a smartphone. “This allows OEMs to continue evolving the industrial design of their mobile devices, offering attractive form factors combined with the benefits of extremely high speeds from mmWave 5G NR, and making such devices available for launch as early as the first half of 2019,” said Qualcomm in a press release. While mmWave is best suited for providing 5G coverage in dense urban areas and crowded indoor environments, broad 5G NR coverage will be achieved in sub-6 GHz spectrum bands. As such, the QPM56xx RF module family (including the QPM5650, QPM5651, QDM5650, and QDM5652) is designed to allow smartphones based on the Snapdragon X50 5G modem to support 5G NR in sub-6 GHz RF bands. The QPM5650 and QPM5651 feature integrated 5G NR PA/LNA/Switch and filtering subsystem. The QDM5650 and QDM5652 feature integrated 5G NR LNA/switch and filtering subsystem for diversity and MIMO support. All four modules offer integrated SRS switching required for optimum massive MIMO applications and support for 3.3-4.2 GHz (n77), 3.3-3.8 GHz (n78) and 4.4-5.0 GHz (n79) sub-6 bands. These sub-6 GHz RF modules provide mobile device makers with a viable path to delivering on the promise of 5G NR massive MIMO technology in mobile devices. Both the QTM052 mmWave antenna module family and the QPM56xx sub-6 GHz RF module family are now sampling to the customers, as confirmed by Qualcomm.